We had such a delicious time on our cooking tour of southern France a few years ago, that we were drooling over a similar Road Scholar offering in southern Mexico. The program materials asserted that Mexican cuisine is one of the three great cuisines of the world along with French and Chinese. Did our experience live up to the assertion? Suffice it to say that it was an earth-shaking experience! 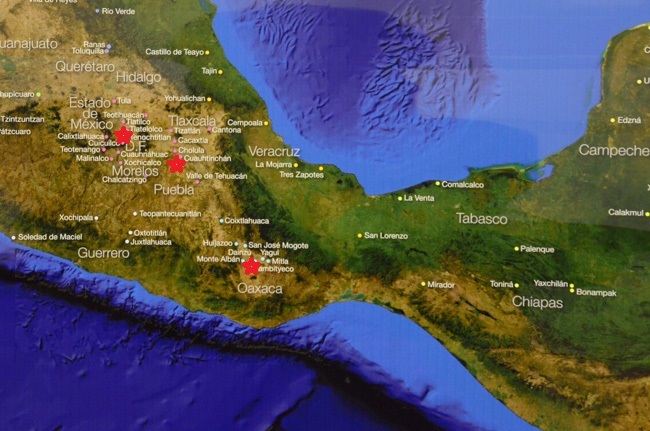 The stars on the map show where we pursued our investigations: Oaxaca in the south and Puebla to the northwest. The nothernmost, Mexico City, was just lagniappe. Along with our eating we would also visit several ancient archeological sites. I've included many external links in the following descriptions. At the time this album was created they were all valid, but the WWW fluxuates. Additionally, many of the web sites addresses include special characters that confound some browsers. The links have been tested with Chrome, Internet Explorer 11, and Firefox. If you encounter broken links, please send us some email. For a brief overview, click here or dig deeper with the links below.